Raspberries are a midsummer fruit, the natural sweet candies, rich in nutrients, antioxidant power and have sweet juicy taste. They are known to be world’s most eaten berries in their category. They are available in different colors like red, purple, black and yellow. 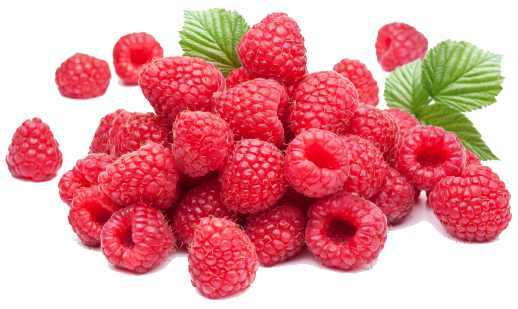 Rich in vitamins, antioxidants and fiber, raspberries are a delicious fruit with many health benefits. Here on this page we will see the amazing health benefits of raspberries. Raspberries can range in color with each color berry having a unique composition of vitamins, minerals and antioxidants. They are rich in vitamin C, vitamin K, vitamin E, folate, iron, and potassium, and manganese. Also in lesser amounts they contain thiamin, riboflavin, niacin, pantothenic acid, vitamin B6, calcium, magnesium, phosphorus, zinc, and copper. Raspberries contain vitamin B2, and B3, needed for increasing energy. 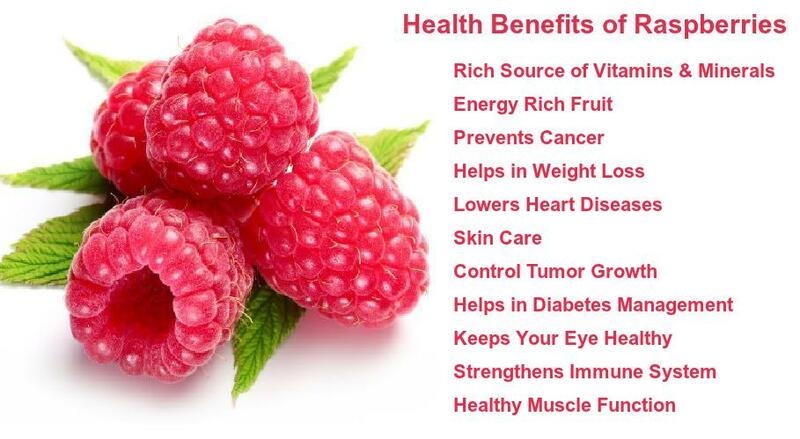 Health Benefits of Raspberries: They have a high concentration of ellagic acid, a phenolic compound that prevents cancer, thereby stopping the growth of cancer cells and eliminating the progress of some cancers. The berries are high in dietary fiber and manganese. As we all know fiber aids in slowing down the digestive process so that we feel fuller for a longer time. Manganese keeps your metabolic rate high and thereby burns fat. The potassium in raspberries supports heart health. The high polyphenol content in raspberries may also reduce the risk of cardiovascular disease by preventing platelet buildup and reducing blood pressure via anti-inflammatory mechanisms. They protect the skin against the sun’s rays. Also, they are used as a natural face mask. The antioxidant powers of vitamin C effectively reduce the age spots and Wrinkles. It helps to maintain healthy and glowing skin. They are rich in fiber, and studies say that eating high-fiber foods help keep blood sugar stable. Foods high in vitamin C like raspberries have been shown to help keep eyes healthy by providing protection against UV light damage.